The question was asked by an elderly man. He was stood outside a building surrounded by lots of other people all wearing fluorescent yellow jackets and holding bin bags. Young and old filled the streets for the “Goring Spring Clean” event. Even the children were prepared with their own tiny litter grabbers and tiny yellow vests. One enthusiastically started picking up leaves whilst his mum patiently tried to explain that not everything on the ground needed to be picked up. In a way, it seemed rather redundant. The pickers had barely begun and the village was already spotless. It was probably spotless before they started. Goring’s that kind of place. The Keep Britain Tidy campaign would find little to complain about there. We weren’t there for the litter. We were there for other reasons: to pick up where we’d left off on our travels. We were there to walk some more of the Ridgeway. That said, I had left some litter of a kind during our train journey. Moments after our litter encounter, I realised my copy of the Ridgeway National Trail Guide was sat on a train heading off to Didcot Parkway. I’d got it out of my pack during the journey and forgot to scoop it up when we got off the train. Thankfully we weren’t to be lost, for Simon had brought his copy. That we even went near the Ridgeway in the first place, well that was Mike’s fault. Mike had been badgering a group of his friends to head out for a day on the Ridgeway for quite some time; his suggestion perhaps something to do with the fact that the later sections are in Hertfordshire and as such, aren’t that far from his abode in St Albans. Eventually that day of walking ended up becoming a plan to make a weekend of it, and to do two days walking in early April. After much scouring of the guide book (which no doubt had now changed trains for a connection to Birmingham or something) I’d found that a good two day walk would start at Goring. We penned it in the diary, booked hotel rooms for six and that was that. Only later did Catherine and myself realise we had some free time, so decided that we’d do the stretch between Overton Hill and Goring as well. Mike, Catherine and myself were joined by Tal, Jenni and Simon. Simon is a gardener with a Classics degree from Durham and who even went to the same college as me at the same time. I probably pulled him a pint of ale or two in the student bar, although it would be many years before we’d be formally introduced. Tal, in contrast, had never been near Durham. Short for Taliesin, Tal’s name is Welsh meaning “shining forehead”. This interesting fact has no relevance on any part of the tale, although it should be said that Tal is not Welsh, and grew up in Kingston-upon-Thames. He is, however, incredibly tall. The story of how Mike, Tal, Catherine and I met could best be told (and probably has been) via a Powerpoint presentation. Part of it involves Jacko. But given he’d decided spending time with his sixth month old son was more important than heading to the hills with us, he need not detain this conversation any further. Jenni on the other hand, should be mentioned. Jenni had started dating Tal some months before, and despite having met us all several times, still seemed to think that joining us on a weekend away was a good idea. 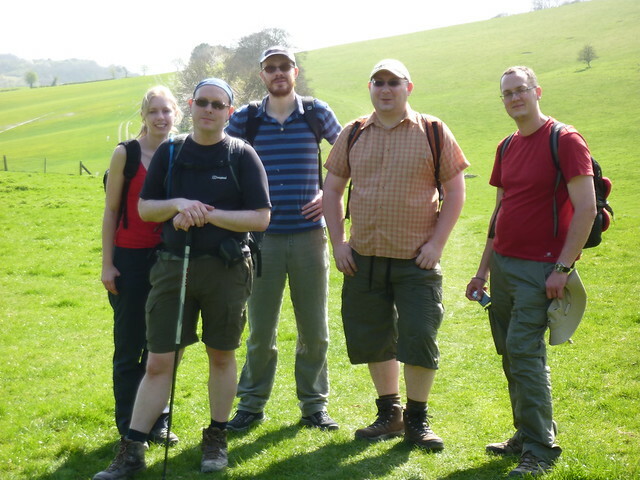 And so it was that the six of us were in Goring and ready to walk the Ridgeway. It was a beautiful morning to be litter picking. Or indeed, walking. The sun was shining brightly; the sky a glorious bright blue. 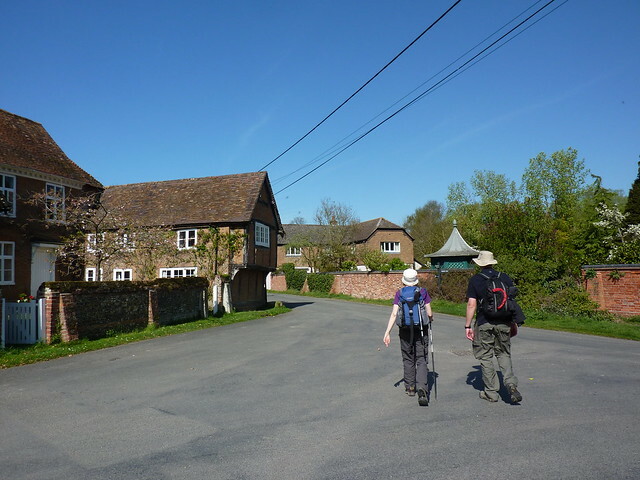 Goring was looking good as the Ridgeway initially took us along narrow alleyways and beside expensive looking houses. 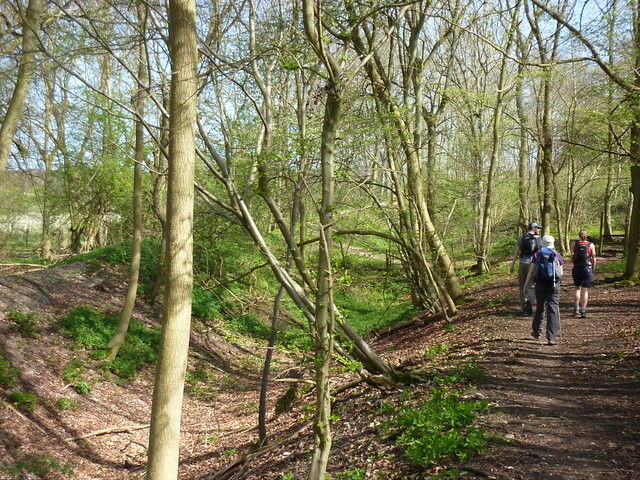 Whilst most of the route to Goring followed the original Ridgeway, the eastern section of the National Trail gets a bit more fluid. Streatley and Goring are the first residential areas the path goes directly through, and it would take a while before we’d leave the houses. Indeed, no soon had we left Goring and we were in the pretty looking village of South Stoke which housed a pub that just called out to be stopped at for a pint. If only it hadn’t been 11am and closed. South Stoke also saw the path come alongside the edge of the River Thames for a few miles, on a wide and grassy path. On the river, a family of four pottered happily and wholesomely upstream in a kayak, whilst a dingy went in the opposite direction followed by a ridiculously large motorboat whose size and speed seemed completely out of proportion. Clearly designed for sea based adventures, it looked bonkers on the river; its owners probably the same kind of people who would buy a 4×4 just to drive round the streets of London suburbs. 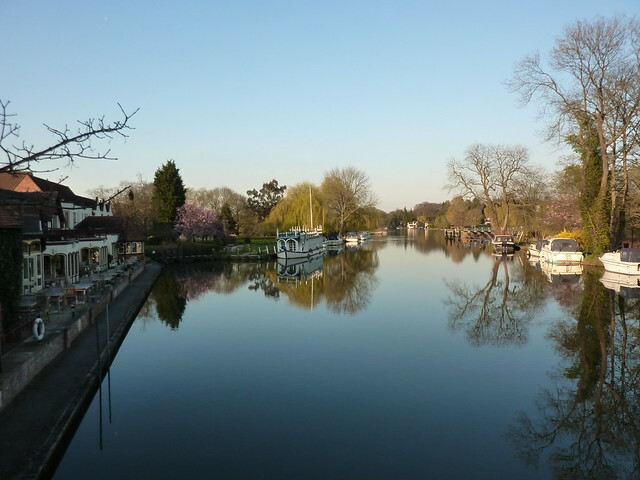 The Thames was only a temporary interlude however, and at North Stoke we bade it our farewells and moved inland on a tree-lined track next to a golf course as we headed up to Mongewell. The trees eventually came alongside the busy A4130. Having spent most of the morning at a distinctively low level, the Ridgeway wasn’t really living up to its name, however a short burst of uphill saw us rise a whopping 50m more in height. The path now went along a small embankment, meaning about on a narrow path between fields. Popping off the path and into a field at least gave us a view of the area, with Didcot Power Station returning to the skyline as we munched happily on our lunches and slapped on additional sun cream. All things said, Grim’s Ditch doesn’t exactly sound the most appealing kind of place, however language can be deceptive. For Grim is an alternative name for the Anglo-Saxon god of war, Woden. Although that doesn’t sound much better either. Grim’s Ditch is, as the name may suggest, a ditch. Or specifically, a five mile ditch in-between two Iron Age man-made embankments. No one is quite sure why they were built. The fact they were named after a god of war suggests a military function, however what they were defending is another question. It all seemed to shallow to do much, even taking into the account that time had lessened its impact, and it did little more than sit between two fields. It’s relatively low height didn’t even provide much of a defensive position, and it’s not hard to imagine an invasion force taking one look at it and deciding to walk round. Mind you, perhaps then it wasn’t surrounded by trees and undergrowth in those days. 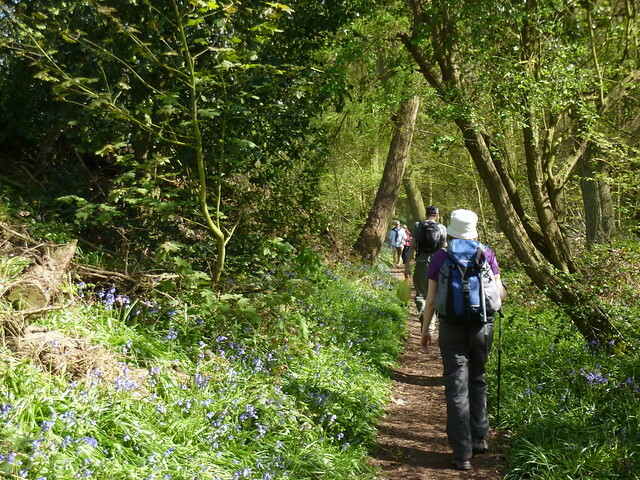 Large branches grew out of it in several sections, and the grass besides the path was filled with wild flowers including a host of bluebells and violets. Walking through it was almost like walking through an enchanted garden, although that image was perhaps ruined by the sheer number of headless rabbit corpses that seemed to be strewn liberally at the far end. Spotting deceased animals seemed to be something Jenni, in particular, delighted in as she pointed them out and tried to get us all to look. Personally speaking, it’s not something I’ve particularly liked looking at, which is why if I do spot something, my eyes are quickly averted. However such speedy glances can often result in me thinking something is a dead animal when it is in fact completely innocuous; the next day I pointed out what I thought to the the feather strewn remains of a bird – a dove or pigeon perhaps – only to be politely told it was a ripped up carrier bag. Mike’s declaration shocked the group to its core. Such a revelation; just how could we ever see him in the same light again? It had got to that time that happens in every walk with a group of 30 somethings: the time when you all, en-masse, start singing the theme tunes of kids TV programmes from your childhood. From the Mysterious Cities of Gold through to Thundercats, we spent roughly an hour going through our repertoire, much to the confusion of Jenni. Being a few years younger than the rest of us, the programmes from her childhood had some noticeable differences. No Ulysses 31, Dogtanian or 80 Days Around the World for her. And certainly no Button Moon meaning she missed out on a whopping episode where the wooden spoon shaped Mr Spoon set off to visit a moon made out a button in his homemade spaceship made out of a baked bean can. A whopping 91 episodes of this classic piece of children’s programming were made, yet Jenni had never seen a single one. Group walking inevitably has a different feel to it than walking with just one person. With six of us, conversations never seemed to stop although perhaps it would be fair to say that by the end of the day the subject matters were getting a little more random. That said, Simon’s gardening expertise had provided many gems earlier including the classic line “that’s a well tilled field”, along with being told that most fields were growing “wheat or barley”. Simon was also keeper of the hallowed guide book and map given that mine was now being puzzled over by a man in a kilt in the Scottish highlands. Not that navigating was particularly hard as the Ridgeway is so well signposted that it’s almost impossible to get lost. However it is handy to be able to judge distances. Simon’s ability in that area might have been slightly lacking given we always seemed to be “two miles or so” from Watlington, no matter where we were. With the sun shining brightly, no one was in a real rush, but as we ambled gently into town thoughts inevitably turned to showers, beer and, in Tal’s case, curry. A curry-a-holic, as soon as anyone had found out the small town of Watlington had an Indian restaurant, well we knew where we’d be eating that night. The curry house was just round the corner from the Fox and Hounds pub where we were staying. We wouldn’t even need to wander very far. “Is it in the name of Victoria?” asked the woman behind the bar as we dumped our rucksacks on the floor and I’d proclaimed we had three rooms booked. Her question was not promising. I’d booked the room online two months before using the pub’s website, so to find out that they’d no record of it anywhere, well that was not the best news. The cause seemed to be due to a change in pub management. The old landlord had seemingly scarpered and not left any details of bookings. A temporary manager, Jude, had taken over, and believing the rooms to be empty, had reserved them for other people. Our beds had gone. Finding room for us in Watlington had been difficult in the first place given it was a Saturday in April. Besides the pub, the village had a B&B which had been full when we’d tried to get in. And that was it. After establishing that a pub six minutes drive away was not much use to a group who had arrived on foot, Jude set about working out the logic puzzle that would allow everyone to stay. With 18 beds and 13 people wanting them, there had to be a solution and after pouring over a piece of paper and a pencil, she found one. It would require some of the other party, a group of seven Americans, to share rooms rather than having them to themselves. whilst four of us would need to share the pub’s family room. The Americans had yet to arrive, and it was a tense feeling as we waited for them to turn up. Would they be nice and helpful people, or the kind who’d just loudly get irate and shout indignantly about poor customer service? Given we all just wanted to freshen up and unwind after fifteen miles of walking, the mood was sombre to say the least. Much cursing would be made of the old landlord running off with our booking and our money. We weren’t the first it had happened to as Jude told me that several times she’d believed the B&B rooms to be empty only to find someone stood on her doorstep. Unfortunately for us, ours was the first time she’d not been able to honour the booking as made. When they did finally arrive, and conversations were gently had about discounts and refunds (similar to the conversations I’d have to have with the company I’d booked through when I returned home, and which certainly wouldn’t be resolved as quickly) we got the thumbs up. As our alternative plan was to abandon the trip, somehow to get to a service station on the M40 and get a coach back to London, it was good to hear. We would live another day. And, most importantly of all, Tal would get his curry. 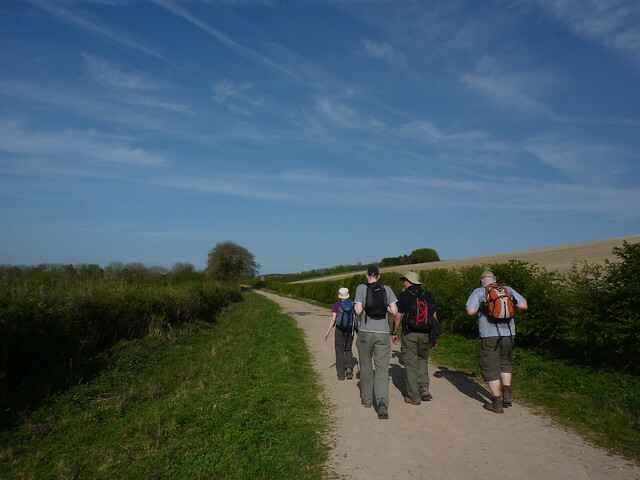 On day 5 we take it easy and head to Princes Risborough, deciding to take lunch at Chinnor. Then changing our minds, we decide to have lunch in Princes Risborough. Then changing our minds, we have lunch at 4:30pm in central London. Plus we did some walking. First Published: 4 May 2011. Last Updated: 16 November 2014.